Connecting to a Bluetooth device is essential for file transferring, audio sharing (Bluetooth speakers), and shared network connectivity (smartphones). GNOME settings panel is offering a quick way to do this in simple steps. Here's a guide on how to do it. First, you need to open GNOME's settings and choose the “Bluetooth” entry. Switch your Bluetooth adapter to ON and wait for it to scan and view available devices. At this point, you should make sure that your device's Bluetooth is also enabled and that it is discoverable. If all is set, you should see the device appear in the list of results. Choosing the entry will open up a dialog that contains a unique code. This is security oriented and if you see the same number on your Bluetooth device as well, you can press the “Confirm” button to continue. Finally, you can press the “Send Files...” button on the new window that will pop up and after choosing a file from your computer, you will be prompt to accept it on your device. The process is really simple and takes only a few moments to set up. The device will remain as “trusted” for your system unless you remove it. 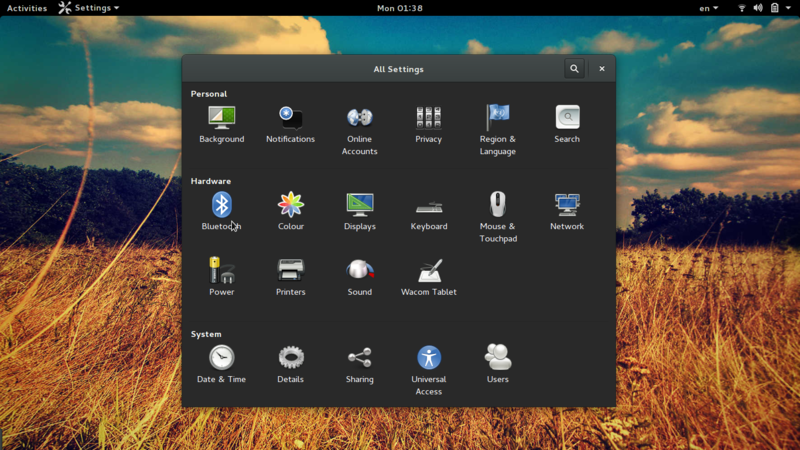 Now if you want to use the device as a network source, you can do so through the menu located on the right of GNOME's top panel. For more options relating to Bluetooth connectivity and functionality, you can dive deeper and install the “obexfs” package that will hopefully work with your file manager to let you browse a paired (connected) device. The “obextool” package which is basically a graphical frontend for obexftp may help you in the case that you're having problems opening up the Bluetooth location. “Blueman” is another choice you can go with. It is a feature-rich Bluetooth devices manager that let you browse devices, connect with them as audio outputs or as network sources. Blueman also shows the devices' address which you can use to mount them using obexfs on the terminal. On a terminal. Then you can use the mounting command as “obexfs -b [device address] /mountpoint”, and the device should now be browsable. 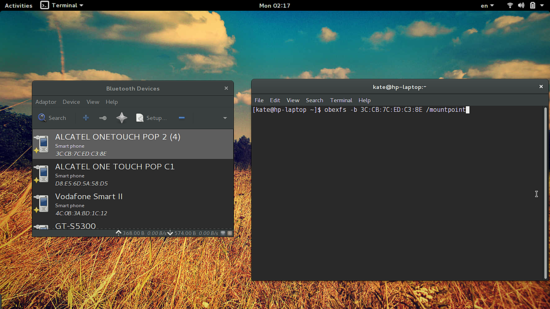 To get an overview of the parameters that can be set to the command. Linux has come a long way in regard to Bluetooth connectivity and while things used to work like a charm in the past, significant parts of the functionality have broken in newer kernel versions. Let us know how the above worked for you and feel free to visit our forums and include information about your Linux version and what kind of device you're trying to connect to in order to get help from our community. I have found only one Linux OS that worked out of the box for Bluetooth and that is Zorin. Not sure why but most find my device (wireless speaker) but no music will play after it is connected.